Your home is your safe haven, and you have lived there for years. It stands to reason that it would also be the safest place to be as you grow older. You know every inch of your familiar home, so there are no surprises, no unforeseen risks that could cause falls, right? Not necessarily. In fact, because you are so familiar with your home and therefore think you don't have to take precautions, falling can actually become even more of a risk. It doesn't have to be, though. Install inexpensive automatic night lights throughout your home so that you can see without turning on lights when you have to get up at night, thus easily preventing falls. These lights turn on and off automatically based on current light levels in the room, so you can simply plug them in and forget them. Pick up your feet, loose rugs on the floor, and any scattered papers, spills, or other slip and fall hazards. Keeping your floor space clear at all times AND making sure that you pick up your feet when you walk so that you don't trip will go a long way toward preventing falls. Loss of physical function that could lead to falls in places like the bathtub or downstairs happens so gradually that you don't even know it. 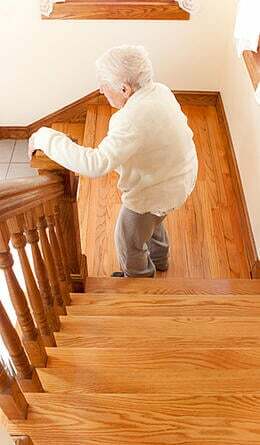 While exercising and keeping fit are important to your overall mobility as you get older, installing a little extra "help" is an easy, unobtrusive, and inexpensive way to prevent falls in places like bathtubs and stairways. Even if you have always kept your oregano on the third shelf of the cabinet to the left of the stove, balance issues can make that sort of reaching tricky even when you are standing on the ground when you do it. While it perhaps should go without saying that stepladders should be forbidden in your house if you having balance issues, you can also fall if you try to reach when your balance is less than perfect. Therefore, make storage easy to access for often used items by putting everything on shelves that are no higher than eye level. To reach items that aren't used as often and need to be stored higher, you can invest in an inexpensive tool (or two) that is sometimes called a "reacher grabber." This is a device with a pair of wide pinchers at the end of a long pole and a handle with a spring-loaded "gripper." Squeeze the gripper handle to open and close the pinchers; this device allows you to get items off of high shelves even standing firmly on the ground, thereby preventing falling. You don't have to lose your independence even when it is time for you to think about preventing falling. A few simple changes to your home environment will keep you safe and on your feet – and away from injury.